Mostly everybody remains crazy for their favorite TV shows and once if you started watching a TV show, then you’ll be addicted to it and never want to miss any episode. But in case if you missed any episode of your favorite TV show, then you will have to wait for weekend or monthly returns of that show. But, with this article I’m going to short out this problem because today I came up with an amazing software “Torrent Episode Downloader (TED)” for you which will download new missing episodes of your favorite TV show automatically. Don’t worry, this article will give you the complete knowledge about how to download TED, where to download, how to use etc. So, now let me tell you the way by which you’ll be able to download, install and use TED software for auto-download new episodes of your favorite TV show. So, you’ve decided to downloading Torrent Episode Downloader (TED)! Have a look on the following steps and easy guidelines to download this software in your PC (Windows/Mac/Linux). STEP 1: First of all, visit an online platform like Softonic, search for Torrent Episode Downloader and click the Download button as shown in following picture. STEP 2: After downloading, you will have to run the setup. STEP 3: Now, int the next screen, click on Next as shown in following screenshot. STEP 4: In the next screen change the path or if it is right, then click on Next to move on to further step. STEP 5: Now, it will start installing the TED software and after completion, click on Finish to finish the wizard. That’s all, after finishing the setup wizard, you can easily launch the Torrent Episode Downloader. You must have Java run time environment to open TED Software. 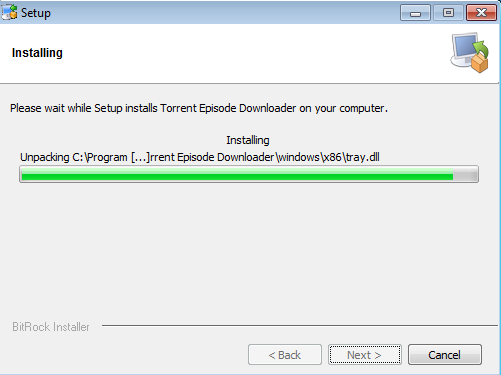 So, now I will tell you how can you auto-download new episodes of your favorite TV show very simply by using Torrent Episode Downloader. First of all, launch the Torrent Episode Downloader. Now click on Add Show to add a show to download its new episodes. Now, in the next screen you’ll see the list of TV shows (left side). So, select your favorite show and then select the episode you want to start downloading and finally click on Add button. Other things you should be notice in the above step is that select the episode you want to download automatically such as Next Episode, Last Aired Episode or Custom Episode. If you want to download the TV Show episode in the HD Quality, then tick the check box “Download in HD quality”. So, by using the same procedure you can schedule as many shows to be downloaded with TED as you want. TVTrigger is the best alternative to TED which also enables you to auto-download new and missing episodes of your favorite TV shows on your PC very simply. TVTrigger is generally a resource of approx 3,000+ TV shows. The TVTrigger’s search engine gives you the ability to search easily for a show by season, episode or just by the name of show.